Just how close are we to repeating the political violence of interwar Germany? How bad is it, and how bad can it get? Populist-right demonstrators and radical-left protesters clashed in Berkeley, California yesterday. The belligerents used such weapons as fists, feet, rocks, pepper spray, smoke bombs, barricades, and a trash dumpster/battering ram. There was one reported non-lethal stabbing. Arrayed on the right were members of the Alt-Right, Oathkeepers, Proud Boys, and non-affiliated Trump supporters, and the left was led by Antifa (Anti-Fascist Action) and BAMN (“By Any Means Necessary”). At one point, the left-radicals ill-advisedly threw a smoke bomb while they themselves were standing downwind. The smoke wafted back in their faces causing them to flee. Today, right-populists are crowing online about having “won the Battle of Berkeley,” because, after a concerted charge, they managed to seize and hold a major downtown street. 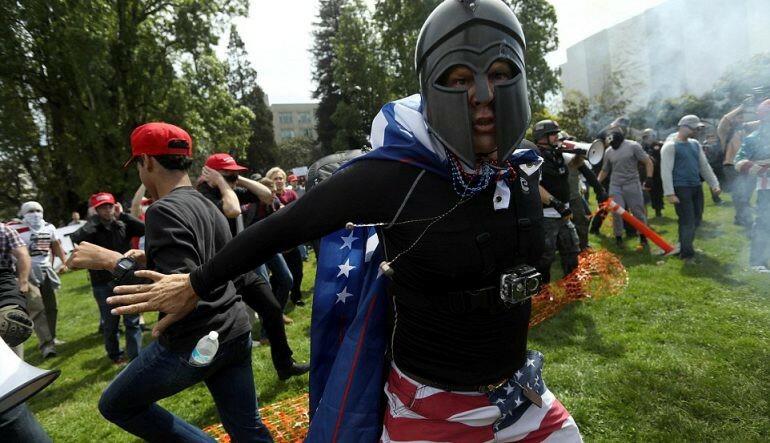 Berkeley has become a favorite battleground for these budding political street warriors. Two months ago, a scheduled speech at UC Berkeley by Alt-Right darling Milo Yiannopolis speech was canceled due to riots, arson, and assaults on Milo-supporters. Weeks later, a “March 4 Trump” was held off-campus in Berkeley, and this too was attacked by militant leftists, using metal pipes, baseball bats, two-by-fours, and bricks. Yesterday, the occasion was another pro-Trump rally in Berkeley celebrating “Patriot’s Day.” As usual, it was the leftists who were the main instigators. That doesn’t alter the fact that these gradually-escalating street conflicts signal a two-pronged threat to liberty. The brawls seem like a half-hearted, semi-play-acting reenactment of the street fights of Germany’s Spartacist uprising of 1919. The “Spartacists” were Marxist insurgents who sought to overthrow the new Weimar government, take power themselves, and expropriate the bourgeoisie. The government, which itself was made up of milder Marxists, relied on nationalist militias called Freikorps to crush the uprising. Then, as yesterday, nationalists trounced communists in the streets. Yet this did not yield a happy ending. As Ludwig von Mises points out in Omnipotent Government, when the Freikorps first arose, they were modeled after the armed bands of communist revolutionaries that they would later suppress. “War and civil war, and the revolutionary mentality of the Marxians and of the nationalists, had created such a spirit of brutality that the political parties gave their organizations a military character. Both the nationalist Right and the Marxian Left had their armed forces. These party troops were, of course, entirely different “from the free corps formed by nationalist hotspurs and by communist radicals. Their members were people who had their regular jobs and were busy from Monday to Saturday noon. On weekends they would don their uniforms and parade with brass bands, flags, and often with their firearms. They were proud of their membership in these associations but they were not eager to fight; they were not animated by a spirit of aggression. Their existence, their parades, their boasting, and the challenging speeches of their chiefs were a nuisance but not a serious menace to domestic peace. But then, feeling threatened by the continued existence and activity of nationalist armed bands, the embattled socialist government created a new armed force consisting of loyal Marxists. As Mises explains, this caused many in the public to throw their support behind Adolph Hitler’s personal militia, the Nazi Storm Troopers. And the rest is History Channel programming. Once in power, the nationalist brawlers proved to be just as deadly foes to liberty as the communists they trounced in the streets and drove from power. Unlike the wholesale violence that our country saw in the late 1960s and early 1970s, contemporary street-level political conflict is heavy on posturing and pretense and light on actual bloodshed — but it does whet degenerate appetites that will grow to dangerous proportions as times get leaner and meaner. Thankfully, we are also nowhere near the level of political street violence that characterized Weimar Germany. But these things have a way of escalating. Just as the right-populists were not content to accept their “defeat” in the First Battle of Berkeley, the left-radicals will not just lick their wounds after the Third Battle of Berkeley. The right is reporting chatter among the left of bringing firearms next time. Such militarization will only breed more polarization and radicalization on the left and the right, both which are driven by a desire to wield state power. And it will provide the police state with a welcome excuse to further assault our already-decimated liberties. The left-wing combatants claim to be anarchists, and yet are furthering the state. The right-wing combatants claim to be for liberty, and yet are putting liberty in danger. If these conflicts continue to escalate, no matter which side “wins,” liberty will lose.